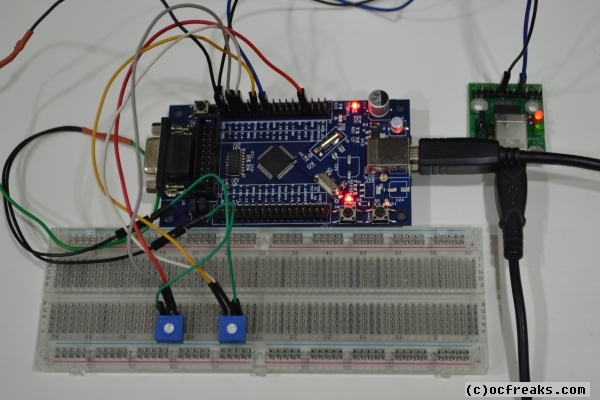 In this tutorial we will go through ARM7 processor based LPC2148 ADC programming. Analog to Digital Conversion(i.e. ADC) , as the name suggests , is all about converting a given analog signal into its digital form or say a digital value. So, what does this mean? Well, basically its measuring the voltage of a given analog signal. The analog signal can be differential, single-ended unipolar, etc. The converted digital value represents the measured voltage. This conversion or measurement happens in presence of a fixed and accurate reference voltage. The analog signal is compared to this reference voltage and then estimations are made to get the final measured value. Note that, here the accuracy depends on how accurate the reference voltage is along with ADC’s internal architecture. ADCs come in many varieties, some of these are : Flash ADC , Sigma-Delta (SD) ADC , Successive Approximation (SAR) ADC , etc. There are many application for ADC like Sensor Interfacing, Voltage measurement, Current measurement using shunt , Converting an audio input to its digital form, etc. ADC on LPC214x is based on Successive Approximation(SAR) conversion technique. You can check the wikipedia article on SAR here. AD0.1 to AD0.4 (P0.28/29/30/25) and AD0.6, AD0.7 (P0.4/5) Analog input pins. Vref This is the reference voltage pin. It must be connected to an accurate reference voltage source. Vdda, Vssa Vdda is Analog Power pin and Vssa is Ground pin used to power the ADC module. Attention Plz : Note that the Analog Power Pin i.e Vdda must be properly isolated/decoupled from Vcc, at bare minimum using a ferrite bead and a decoupling capacitor, to suppress noise present on Vcc rail and also to suppress MCU’s switching noise which can be induced on the Vcc rail. If you have any confusion or query regarding ADC power pin isolation, just comment to this post below and I’ll try to help you out. 1) AD0CR – A/D Control Register : This is the main control register for AD0. Bits[7 to 0] – SEL : This group of bits are used to select the pins(Channels) which will be used for sampling and conversion. Bit ‘x'(in this group) is used to select pin A0.x in case of AD0. Bits[15 to 8] – CLKDIV : These bits stores the value for CLKDIV which is used to generate the ADC clock. Peripheral clock i.e. 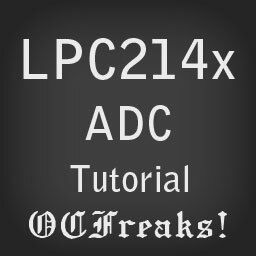 PCLK is divided by CLKDIV+1 to get the ADC clock. Note that ADC clock speed must be <= 4.5Mhz! As per datasheet user must program the smallest value in this field which yields a clock speed of 4.5 MHz or a bit less. Bit 16 – BURST : Set this to 1 for doing repeated conversions. Set this bit to 0 for software controlled conversions , which take 11 clocks to finish. Here is a remark from datasheet : START bits must be set to 000 when BURST=1 or conversions will not start. Refer datasheet for detailed info. Bit 21 – PDN : Set it to 1 for powering up the ADC and making it operational. Set it to 0 for bringing it in powerdown mode. 2) AD0GDR – A/D Global Data Register : This is the global data register for the corresponding ADC module. 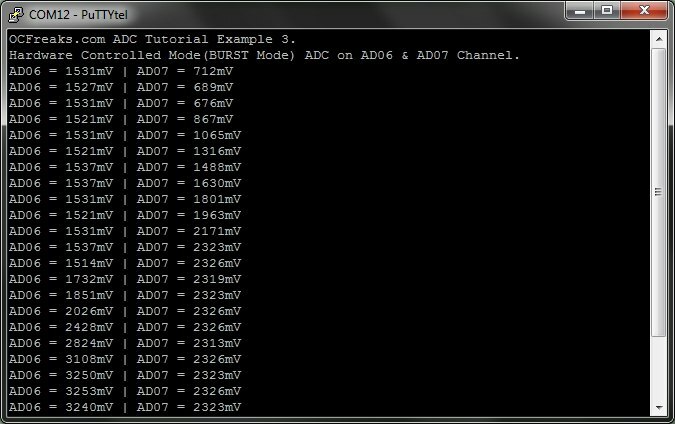 It contains the ADC’s DONE bit and the result of the most recent A/D conversion. Bits[15 to 6] – RESULT : Given DONE(below) is set to 1 these bits give a binary fraction which represents the voltage on the pin selected by the SEL field, divided by the voltage on Vref pin i.e. =V/Vref. A value of zero indicates that voltage on the given pin was less than , equal to or greater than Vssa. And a value of 0x3FF means that the voltage on the given pin was close to, equal to or greater than the reference voltage. Bits[26 to 24] – CHN : It gives the channel from which RESULT bits were converted. 000 for channel 0 , 001 for channel 1 and so on. Bit 30 – OVERRUN : In burst mode this bit is 1 in case of an Overrun i.e. the result of previous conversion being lost(overwritten). This bit will be cleared after reading AD0GDR. 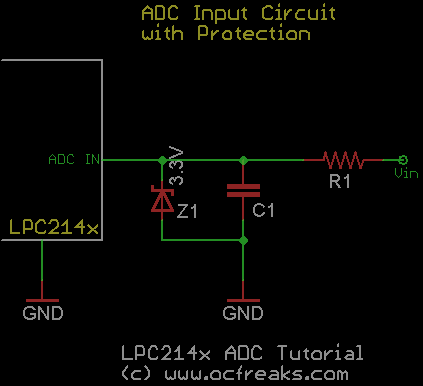 Bit 31 – DONE : When ADC conversion completes this bit is 1. When this register(AD0GDR) is read and AD0CR is written, this bit gets cleared i.e. set to 0. If AD0CR is written while a conversion is in progress then this bit is set and a new conversion is started. 3) ADGSR – A/D Global Start Register : This register is used to simultaneously start conversion process of both ADC modules. Bit 16 – BURST : Same as given for AD0CR. Bits[26 to 24] – START : Same as given for AD0CR. Bits 27 – EDGE : Same as shown for AD0CR. 4) AD0STAT – A/D Status register : This register contains DONE and OVERRUN flags for all of the A/D channels along with A/D interrupt flag. Bits[7 to 0] – DONE[7 to 0] : Here xth bit mirrors DONEx status flag from the result register for A/D channel x. Bit 16 – ADINT : This bit represents the A/D interrupt flag. It is 1 when any of the individual A/D channel DONE flags is asserted and enabled to contribute to the A/D interrupt via the ADINTEN(given below) register. 5) AD0INTEN – A/D Interrupt Enable Register : Using this register interrupts can be enabled or disabled for any ADC channels. Bits[0 to 8] – ADINTEN[0 to 8] : If xth bit is set to 1 then an interrupt will be generated on completion of A/D conversion on channel x. Similarly if this bit is set to 0 then an interrupt wont be generated. 6) AD0DR0 to AD0DR7 – A/D Data registers : This register contains the result of the most recent conversion completed on the corresponding channel [0 to 7]. Bit[15 to 6] : Same as given for AD0GDR. Bit 30 – OVERRUN : Same as given for AD0GDR. Bit 31 – DONE : Same as given for AD0GDR. 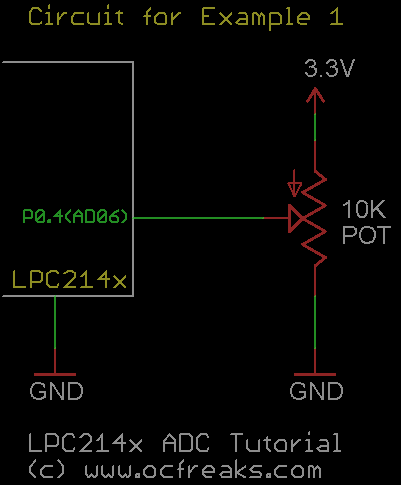 Low pass anti-aliasing filter was discussed in LPC214x Sine PWM tutorial under ‘Filter Design’ section which can be found here. To measure voltages greater than the reference voltage you can use a simply use a voltage divider configuration using 2 resistors with known values. The selection of these resistors depends on the maximum voltage that is to be measured. 1. Software controlled mode : In Software mode only one conversion will be done at a time. This conversion can be controlled in software. To perform another conversion you will need to re-initiate the process. In software mode only 1 bit in the SEL field of AD0CR can be 1 i.e. only 1 Channel(i.e. Pin) can be selected for conversion at a time. You can do conversions on multiple Channels (one at a time) by selecting a particular Channel along with appropriate bit in SEL field and then do the same for rest of the channels. 2. Burst or Hardware mode : In Burst or Hardware mode conversions are performed continuously on the selected channels in round-robin fashion. Since the conversions cannot be controlled by software, Overrun may occur in this mode. Overrun is the case when a previous conversion result is replaced by new conversion result without previous result being read i.e. the conversion is lost. Usually an interrupt is used in Burst mode to get the latest conversion results. This interrupt is triggered when conversion in one of the selected channel ends. First we will define some values which will help us setup the AD0CR register to configure the AD0 block before we can use it. Note that AD0CR can be assigned/setup in a single step. But I am doing it in three steps to keep things simpler. Configuring ADC Module is similar to what was done in software controlled mode except here we use the CLKS bits and don't use the START bits in AD0CR. ADC_DONE is also not applicable since we are using an ISR which gets triggered when a conversion completes on any of the enabled channels. while( (AD0DR6 & ADC_DONE) == 0 ); //this loop will terminate when bit 31 of AD0DR6 changes to 1. Note that in this case no input protection & filtering was required hence I had skipped it. LPC2148 ADC Example 1 Source Code. This example is similar to Example 1. Here additionally we use P0.5 i.e. AD07 for Analog to Digital Conversion. Even in this case a 10K potentiometer was used for testing. The connections are similar to what given above. LPC2148 ADC Example 2 Source code. voltage = ((float)result*VREF)/1024; //Convert result to volts. The serial output is similar to example 3 except that this was done in Software mode. Here Burst Mode is used for AD conversion. In this example we use an ISR (AD0ISR) which is invoked when a completion occurs in channel 6 or 7. In the ISR we first find the channel number and the extract the result. Here I've used global variables for storing the result so it can be accessed by the 'main()' function which is outside its scope. LPC2148 ADC Example 3 Source code. volt1 = ((float)AD06Result*VREF)/1024; //Convert AD0.6 result to volts. volt2 = ((float)AD07Result*VREF)/1024; //Convert AD0.7 result to volts.